Above: From Enchiladas Herra to tableside guacamole, El Bruno&apos;s rules. That location burned to the ground from an electrical fire 13 years ago. “We started all over again,” Hazel says, this time in the former Tastee Freez just across the street. Locals come in daily for lunch, looking for Enchiladas Herrera (made with red chile and pork). Sunday breakfast draws a crowd, and the acclaimed margarita has customers begging for the special (and secret) recipe. 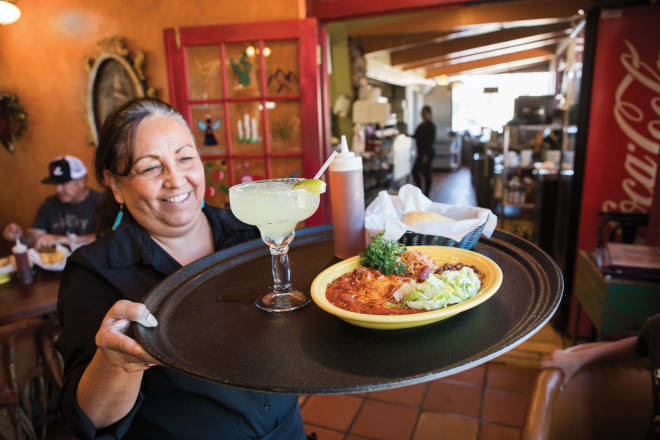 The restaurant hosts many international visitors en route to Chaco Canyon—to Hazel, to be known as far away as France is all the recognition she needs. El Bruno’s also earned a nod from Guinness World Records for the world’s longest burrito, 1.75 miles long. But it’s their famous green chile—roasted, peeled, and ground by El Bruno himself—that brings folks in, along with handmade tamales and taquitos. Stop in at either the Cuba location or the newer Albuquerque site and meet El Bruno, La Hazel, and the rest of the family.